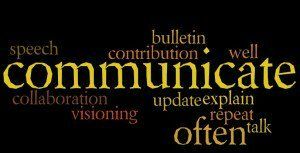 As education experiences reform and change, goodcommunication from school leaders is more important than ever. Television, film, popular media and others are frequently discussing educational trends. Add to that, the ever evolving changes in the world of technology. It is more important than ever for school leaders to have clear communication strategies. A clear message from school leadership around educational programs supported by technology is necessary. A good communications strategy can make all the difference in providing quality programs that make a difference for the students we serve. These strategies explain the school's vision for change and encourage collaboration and participation within the school community. How can school administrators and leaders best communicate regarding 21st Century digital age change and technology? Below is a communications checklist for School Technology Leadership which I based on the Nets A (National Educational Technology Standards for Administrators). You may want other items for your list. Here is a checklist to think about.